Figure 2.2. Staphylococcal pyoderma of the neck in an infant at the age of 8 days. Figure 2.3. Bullous impetigo (pemphigus neonatorum) in a newborn infant at the age of 6 days. This infection may occur as early as the second day or as late as two weeks of life and may demonstrate bodi bullous and impetiginous lesions. 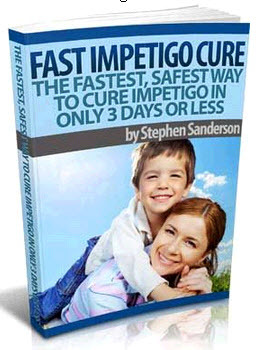 It is most commonly due to a staphylococcal infection but, on occasion, is caused by Streptococcus. The lesions are more common in moist, warm areas such as the axillary folds of the neck or the groin and present as superficial bullae which are wrinkled, become flaccid, and rupture easily producing ulcers which become crusted. Note the impetigo of the umbilical area. Figure 2.4. Scalp abscesses developed at 12 hours of age. Note the distribution over the area of the caput. In such an infant the diagnoses of herpes simplex and Staphylococcus aureus infection should be considered. Cultures from the lesions and the blood in this infant were positive for Staphylococcus aureus. The mother developed fever 24 hours postpartum, and Staphylococcus aureus was cultured from the episiotomy. Figure 2.5. 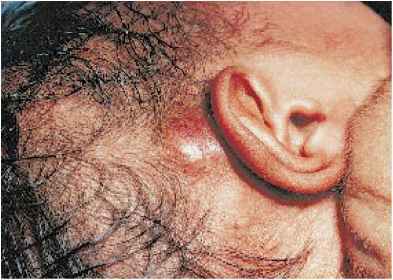 This nosocomial scalp abscess developed in a premature infant (birthweight 1000 g) at the age of 12 days. Staphylococcus aureus was cultured from both the abscess and the blood. 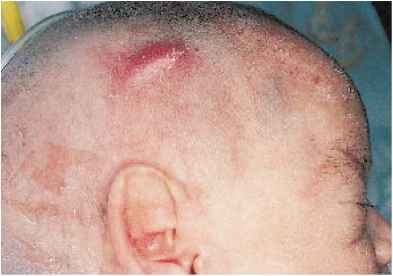 The parietal area is the most frequent site for scalp abscess. 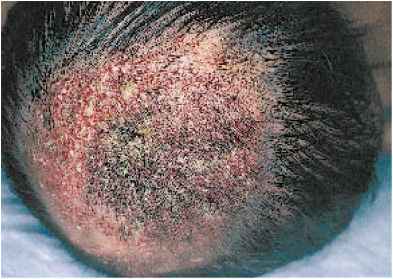 Scalp abscesses frequently occur with the use of repeated scalp vein infusions. Figure 2.6. Postauricular scalp abscess in an infant due to Staphylococcus aureus infection as a result of forceps application.